There are only two reasons New Jersey Governor Chris Christie would visit Iowa — and the state fair’s famous butter cow won’t be on display for another three weeks. That means Christie’s campaigning for president, and the New York Times has some details on just what that will look like. Christie’s schedule has him hitting three cities on something of a handshake tour, ostensibly in support of Iowa’s Republican governor Terry Branstad, but really designed to show off his personality and skills at retail politics, which he sees lacking in his likely tea-party opponents. Showcasing the people skills of someone widely considered a bully, especially in the wake of the George Washington Bridge scandal, might seem an unexpected strategy. But it’s that brashness that Iowans love. As one told the Times, “He will sometimes stick his foot in his mouth. But he tries to tell like it is. 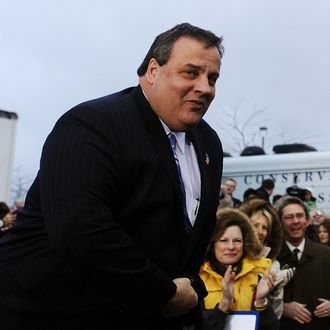 I really like that about him.” As for Bridgegate, no one in Iowa seems to care. “Really, most people here have never heard of it and don’t care much about it,” Governor Branstad said. So the problems plaguing Christie in the media and his home state might not matter in Iowa, but new ones are cropping up. Yesterday the conservative group Judicial Crisis Network put out a web ad, with requisite Obama handshake picture, attacking Christie for appointing “liberal activist judges” to the state Supreme Court. With more attacks like this coming from Republicans, Christie’s future might rest with the ever-important independent vote. But there’s bad news there, too: A recent Quinnipiac poll found that 30 percent of Iowa’s independent voters like Christie, while 34 percent don’t.